With our increased reliance on software, faulty and insecure applications put your data and the data of your business partners at risk. This can have repercussions well beyond any one incident and application security is the only way to protect against the risk. Join Colin Domoney, previously Head of Appsec at Deutche Bank, as he discusses why applications are so risky, why you need to include application security in your security programme, as well as how he got started with Application Security. Many commentators observe that the IoT devices just aren’t up to scratch, when it comes to security. GDPR requires vendors to and service providers to design things with security as standard. In February 2019, the European Standards body ETSI published security guidelines for the consumer Internet of Things aligning with IOT Security Compliance Framework. IoT requires the best in all aspects of security — physical, operational technology, and cybersecurity. Thus, it makes sense to envisage IoT security as an ecosystem in itself. Unexpected challenges are likely to erupt because of the existence of several layers in the IoT ecosystem. This calls upon leaders to initiate regular automated risk assessments and simulations such that IoT specific breaches can be monitored closely. This helps businesses build reliable playbooks that enable organizations to respond to IoT security challenges. Software installed on these devices could be potentially vulnerable, if it has not an automated security assessment before deployment. We take a look at how it’s possible to make the software that drives these devices and the backend serverless technologies secure based on requirements in IOT Security Compliance Framework. The full stack developer is likely to play an increasingly important part in the future of web development, especially as the field continues to increase in scope and complexity. A developer who can communicate about and work on a website’s look and feel as well as manipulating data and managing its backend will offer a great deal of value to development teams and organisations. As applications continue to be the #1 vector for attackers seeking to breach enterprise security, the full stack developer must have a working knowledge of application security best practices. When writing code for web applications, developers must be able to avoid threats such as a cross site scripting vulnerability or Java SQL injection. Superior developers will also know how to integrate app security testing into the development process. Join Chris Campbell - Solution Architect at Veracode - for this live webinar, where he will delve into how a full stack engineer creates secure software from the start. This webinar will provide a comprehensive look at the security features of the Azure DevOps CD/CD platform. The topics include built-in security features such as user access controls and branch policies; and an overview of best practice for the incorporation of various 3rd party security tooling such as Veracode Greenlight within your pipeline. Other topics include best practices for pipeline telemetry, reporting, pipeline protection and templates for security best practices. Whether you are a software developer using Azure DevOps, a security manager or a DevOps expert this webinar should further enhance your expertise in secure software delivery with Azure DevOps. Register for this live webinar where Colin Domoney - DevSecOps Consultant at Veracode - will leave you with a clear understanding of how to Secure your DevOps Pipeline. Containerisation of software is helping firms to completely change how applications are deployed to meet the demands of the business. The technology has the potential to radically reduce the cost of ownership of capability, and puts enormous power in the hands of the DevOps engineer. These benefits also change the nature of how risk may need to be addressed in the development lifecycle. Not only does the software application need to meet the security standards of the organisation within the Docker Container, but also the base image needs to be free from exploitable vulnerabilities. Join Julian Totzek-Hallhuber - Solution Architect at Veracode - for this live webinar where he will explore approaches that embrace the secure use of containers in pipelines. Once you define, adopt and standardize application security best practices for protecting your software, the next step is to determine how your program integrates into your existing environment. The Veracode Platform integrates with the development, security and risk-tracking tools you already use. Coupled with our broad range of APIs, your teams can create your own custom integrations or leverage those from open source community. According to IDG, 84% of surveyed IT Leaders agree that their companies are concerned about the potential data security risk posed by third-party applications. How can companies assure customers that they will protect their critical data while maintaining a competitive advantage in the market? "Data breaches continuing to make the headlines and enterprises are no longer questioning ""if"" a breach will occur, but ""when."" With the organization's data assets and reputation at stake, having a breach response plan in place is becoming increasingly important. Il software ha cambiato il modo in cui comunichiamo, forniamo assistenza sanitaria, gestiamo affari, gestiamo i nostri governi, eleggiamo i nostri leader, diamo inizio a rivoluzioni e persino stimoliamo il cambiamento sociale. Nel mondo digitale, la creazione di software contribuirà a stimolare la crescita economica e migliorare la qualità della vita. Ma il nostro più grande catalizzatore per il cambiamento è rappresentato anche dalla fonte della vulnerabilità. Quando si tratta di assicurare il software che sviluppano, le aziende europee sono molto indietro rispetto alle loro controparti americane. IIn questo webinar dal vivo, presentato da Giuseppe Trovato, Principal Security Researcher per Veracode, verranno presentati i dati del rapporto annuale sullo stato della sicurezza del software, con particolare attenzione al modo in cui le società europee si confrontano con le società aventi sede negli Stati Uniti. Il software viene creato avendo il mente la sua utilizzabilita’ e le sue prestazioni, ma anni di dati, insieme a violazioni su violazioni, dimostrano che il software non è stato creato pensando alla sicurezza. Software has changed the way we communicate, provide healthcare, conduct business, run our governments, elect our leaders, mount revolutions and even spur social change. In the digital world, the creation of software will help spur economic growth, and improve our quality of life. But our greatest catalyst for change is also the source of vulnerability. When it comes to securing the software they develop, European companies are far behind their American counterparts. In this live webinar, Paul Farrington, Director of Solutions Architects at Veracode, will present data from the annual State of Software Security Report, with a focus on how European companies compare to U.S.-based companies. Software is created with usability and performance in mind, but years of data, along with breach after breach demonstrates that software is not created with security in mind. You have taken the first step toward the fight against the proliferation of software vulnerabilities. Now is the time to define, adopt and standardize application security best practices for protecting software, data and users. With the right technology and program in place, you can implement application security best practices- such as testing, defining code standards, and creating standard policies- that integrate into the workflow of your development teams. Join this webinar to hear one of Veracode’s security program experts will show you how to define your application security programs and establish best practices in a simple and cost-effective way. Based on first-hand experience with onboarding customers, you will acquire practical tips on integrating security into the software development lifecycle- all the way to scaling an application security program using our cloud-based platform. Software hat die Art und Weise verändert, wie wir kommunizieren, Gesundheitsfürsorge anbieten, Geschäfte abwickeln, Regierungen regieren, Führungspersönlichkeiten wählen, Revolutionen aufbauen und sogar soziale Veränderungen anstoßen. In der digitalen Welt wird die Erstellung von Software das Wirtschaftswachstum ankurbeln und unsere Lebensqualität verbessern. Unser größter Katalysator für Veränderungen ist jedoch auch die Ursache für Verwundbarkeit. Wenn es um die Sicherung der von ihnen entwickelten Software geht, liegen europäische Unternehmen weit hinter ihren amerikanischen Kollegen. In diesem Live-Webinar Julian Totzek-Hallhuber, Solutions Architect für Veracode werden Daten aus dem jährlichen Bericht zum Zustand der Software-Sicherheit präsentiert, in dem der Vergleich europäischer Unternehmen mit US-amerikanischen Unternehmen im Mittelpunkt steht. Software wird unter Berücksichtigung der Benutzerfreundlichkeit und der Leistung erstellt, aber langjährige Daten sowie ein Angriff nach dem anderen zeigen jedoch, dass Software mit nicht ausreichenden Sicherheitskonzpeten im Hintergrund erstellt wird. Les logiciels ont changé notre façon de communiquer, de fournir des soins de santé, de mener des affaires, de gérer nos gouvernements, d’élire nos dirigeants et même de suivre les changements sociaux. Dans le monde numérique, la création de logiciels veut aider à augmenter la croissance économique et à améliorer notre qualité de vie. Mais notre plus grand catalyseur de changement est aussi une grande source de vulnérabilité. Sur le niveau de la sécurité applicative, les entreprises européennes sont loin derrière leurs contreparties américaines. Dans ce webinaire, Nabil Bousselham, Principal Solutions Architecte chez Veracode, souhaite vous présenter quelques résultats de notre rapport annuel sur l'état de la sécurité logicielle, en faisant référence aux sociétés basées aux États-Unis. Les logiciels sont créés plutôt avec un focus sur la fonctionnalité et la performance, mais plusieurs années de données, ainsi que les Data Breach successives démontrent clairement qu’il y’a encore un grand travail á faire au niveau de la sécurité logicielle. El software ha cambiado la forma en que nos comunicamos, brindamos atención médica, hacemos negocios, dirigimos nuestros gobiernos, elegimos a nuestros líderes, montamos revoluciones e incluso fomentamos el cambio social. En el mundo digital, la creación de software ayudará a estimular el crecimiento económico y mejorar nuestra calidad de vida. Pero nuestro mayor acelerador para el cambio es también una fuente de vulnerabilidad. Cuando se trata de asegurar el software desarrollado, las empresas europeas están muy por detrás de sus homólogas estadounidenses. En este seminario web en vivo, Antonio Reche, EMEA Solution Architect de Veracode, presentará los datos del Informe anual sobre el estado del software, con un enfoque en cómo las empresas europeas se comparan con las empresas de U.S. El software se crea teniendo en cuenta la facilidad de uso y el rendimiento, pero años de datos junto con múltiples y continuas brechas de seguridad, demuestran que el software no se crea teniendo en cuenta la seguridad. Glasswall BV provides a standardised security testing process of outward facing Odoo implementations. Using Open Source tooling (as used by Black Hat hackers) we generate in depth reports on known vulnerabilities and their remediation. In addition to that Veracode brings an extra layer of security to the table. Using Veracode’s code review scanning capabilities, you can gain visibility on the most fundamental part of any software implementation, the code itself. In this webinar Nabil Bousselham, Principal Application Security Consultant at Veracode will present the results of an analysis he performed on an example Python library using Veracode Static Analysis. Those viewing will leave the talk with a more rounded understanding of possible routes towards safer Odoo implementations. In our recent State of Software Security Volume 9 report, Veracode examined fix rates across 2 trillion lines of code shows that the number of vulnerable applications remains staggeringly high. More than 85 percent of all applications contain at least one vulnerability following the first scan, and more than 13 percent of applications contain at least one very high severity flaw. One thing is certain: the sheer volume of vulnerabilities present in most organizations’ application portfolios makes it necessary for them to make daily tradeoffs between security, practicality, and speed. There are just too many vulnerabilities for organizations to tackle all at once, which means it requires smart prioritization to close the riskiest vulnerabilities first. For the first time, our report shows a very strong correlation between high rates of security scanning and lower long-term application risks, which we believe presents a significant piece of evidence for the efficacy of DevSecOps. In fact, the most active DevSecOps programs fix flaws more than 11.5 times faster than the typical organization, due to ongoing security checks during continuous delivery of software builds, largely the result of increased code scanning. Join guest presenter Amy DeMartine, Principal Analyst, Forrester Research Inc., and Veracode’s Chris Eng as they deliver valuable takeaways for business leaders, security practitioners and development teams seeking to secure their applications. Listeners will learn potential prioritizations and software development methods that could help their organizations reduce risk more quickly. Veracode continues to build and expand a strong community to support the people and teams that make your organization’s software secure. The Veracode Community provides a resource and forum for customers as well as developers or security professionals seeking best practices about securing applications throughout the development lifecycle. 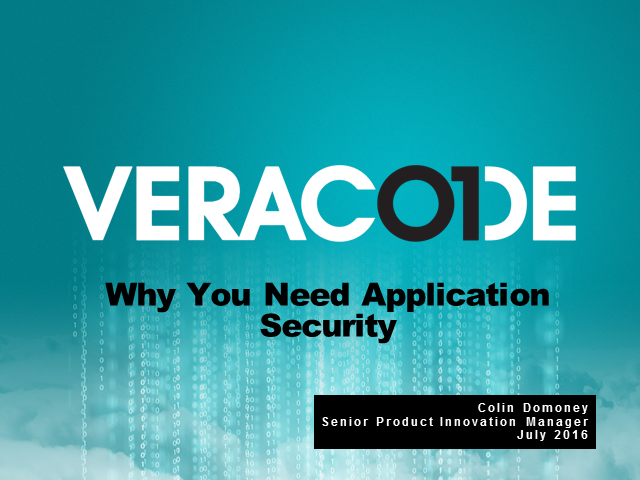 Hear from one of our customer-facing Services experts to learn how you can leverage the Veracode platform to optimize your application security program. You will start with assessing and managing security risk across your entire application portfolio and gain additional insights into how Veracode can help you adopt application security best practices in a simple and cost-effective way. Based on first-hand customer interactions, you will come away practical guidance to integrating testing into the software development lifecycle- all the way to scaling an application security program using the Veracode cloud-based platform. Traditionell haben die meisten Führungskräfte die IT Sicherheit als notwendiges Übel betrachtet - eine Investition, die nur erforderlich war, um ein schlechtes Ergebnis zu vermeiden, aber nicht als etwas, das neue Kunden einbringen oder den Umsatz steigern würde. Aber das scheint sich zu ändern. Wir stellen zunehmend fest, dass die Erstellung sicherer Software zu einem Wettbewerbsvorteil führt und das Endergebnis steigert. Dieses Webinar, das von Julian Totzek-Hallhuber - Principal Solutions Architect bei Veracode gehalten wird, hilft Ihnen dabei, AppSec zu unterstützen. Durch die Darstellung des möglichen ROI einer Cloud-basierten Anwendungssicherheitslösung, die in den Softwareentwicklungslebenszyklus integriert ist, stellen wir Ihnen die Tools zur Verfügung, die Sie zur Erstellung Ihres C-Level-Pitch benötigen.